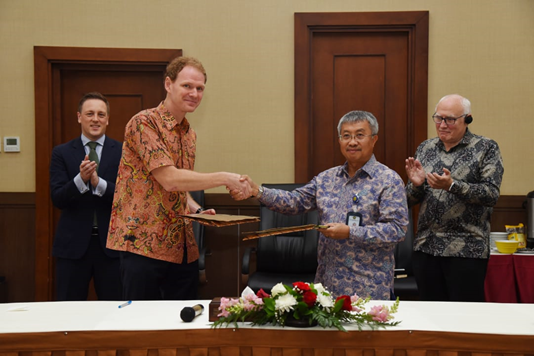 In the context of accelerating geothermal development in the East Nusa Tenggara Province, the ESDM Ministry of Research and Development collaborated with Eastern Indonesia Geothermal Consortium which was marked by the signing of a memorandum of understanding on geothermal development on Flores Island. Eastern Indonesia Geothermal Consortium consists of North Tech Energy, Turboden SpA and SATE Ltd, which are interested in developing a geothermal field on Flores Island to meet electricity in the East Nusa Tenggara Province. The consortium's collaboration with the Public Service Agency (BLU) in the ESDM Research and Development Agency is intended to facilitate the consortium's investment in geothermal development and exploitation. "The ESDM Research and Development Agency can partner with Business Entities through Operational Cooperation (KSO) or Management Cooperation (KSM) to help accelerate geothermal investment," said Head of ESDM Research and Development Agency, Sutijastoto, after the signing at the Ministry of Energy and Mineral Resources Office (29 / 1) that. Currently the biggest economic development in East Nusa Tenggara (NTT) comes from the tourism, mining, marine and geothermal industries. There are 11 mineral mining companies in Manggarai Regency and need a large amount of electricity. One of them is processing manganese smelters, which require 10 MW of energy. The biggest energy potential that can be utilized in East Nusa Tenggara (NTT) is geothermal energy of 1276 MWe and 776 MWe of which are found on Flores Island. Therefore Flores Island is designated as Geothermal Island, through the ESDM Ministerial Decree Number 2268 K / 30 / MEM / 2017. Of the 12 geothermal prospect areas, there are three regions that have obtained WKP (Geothermal Work Area) management permits from the Minister of Energy and Mineral Resources, namely Ulumbu, Mataloko and Sokoria. The consortium took the initiative to develop geothermal potential on the island of Flores, using more efficient and inexpensive technology and methodologies, namely the technique of slim hole drilling in exploration and production drilling. For the production phase, the consortium will use turbines with wellhead turbine technology which is directly installed on top of the geothermal well. Turbine can be adjusted to the character of each well, both temperature and pressure. This technology is right for small-sized geothermal fields and not too large electricity needs. The consortium is divided into two groups, namely the service provider group and the equity provider. Service providers consist of ISOR (Icelandic Geological Agency) and HIVOS. ISOR experienced mapping below ground level, 3G data analysis, determination of drilling targets and assistance during drilling. HIVOS is a Dutch international non-governmental organization whose role is to prepare communities in geothermal development locations. HIVOS advertises preparation and training at the community level to form a business unit that utilizes electricity supply from geothermal energy and develops electricity-powered households. The parties who are members of the equity provider are North Tech Energy (NTE) BV, Turboden SpA, EMO and Infunde Capital. NTE BV acts as a service provider and equity provider. Turboden SpA is a turbine producer with organic rankine cycle (ORC) technology, FMO (Dutch Government Development Bank) provides financing for geothermal development.